Author: Gaspar van Wittel (Amersfoort, 1652/53-Roma, 1736). Dimensions: 74 x 171.8 cm. Current location: Carmen Thyssen-Bornemisza Collection on loan at the Museo Thyssen-Bornemisza, Inv. no. (CTB.1996.36). The picture describes the military sector of the port of Naples, with the royal residence (Reggia) on the left (whose final spur corresponds to the so-called "casina spagnuola"), and Castelnuovo on the right, joined by the still existing arches over which the Charterhouse of San Marino looms in the distance. The present work is one of a considerable number of renditions of this favourite theme of Van Wittel's, a total of nineteen (of which Briganti, in 1966, listed only eight). The Dutch painter never represented this subject in a perfectly identical manner, nor consequently in an identical format. To this key fact one must obviously add the (sometimes almost imperceptible) variety of perspectival viewpoints of the single views, quite apart from the lesser aspects such as the position and the number of ships or of figures standing on the quaysides. A number of these views of the harbour at Naples bear a date falling somewhere between that of the picture in the Carlo Genovese Collection in Naples, which has the inscriptions «Gasp. Van Wittel» and «1700» on the fountain and on sacks, respectively, and that 1718 corresponding to the picture that was with Sotheby's in London on 19 April 1989. The date of the first view -close to the date of Van Wittel's first stay in Naples, according to Pascoli's documents in which he states that the painter arrived in 1699 and stayed for two years and a few months- is, in any case, the year in which his famous architect son Luigi was born on 12 May. 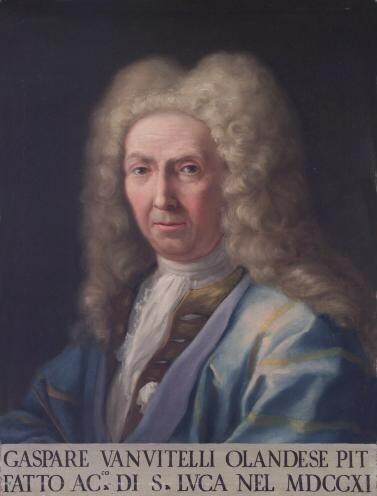 Van Wittel was invited to Naples by the Viceroy Don Luis de la Cerda, Duke of Medinaceli, who moved to the city in 1695 after having served as ambassador to the King of Spain in Rome. It is symptomatic that this same illustrious person should have been present at the baptism of the future Luigi Vanvitelli. The view in the Genovese Collection is undoubtedly very close to the Thyssen one, which is seen from slightly closer in. Each has an identical ship moored on the left, seen from behind, with its lowered sail; each has a boat at a right angle to it, docked slightly further over, with a sail covering most of its deck. The boats on the right, however, are different: where the Thyssen canvas shows a ship moored to the pier, the Genovese picture has two smaller boats moored at a right angle to the pier. A perspective very similar to that painted in the Genovese and Thyssen views occurs again at least in the version of the Banca Popolare di Novara in Naples (1708), and in that in the Galleria Sabauda in Turin (1711), allowing for differences in the sizes and positions of the boats depicted. This subject is a particularly important one in the career of Van Wittel not only because of the newly revealed frequency with which the artist returned to it, but also, and more importantly, because it was just one such view that the painter entered for his admission to the Roman Accademia di San Luca in October of 1711. This picture could be the view now in the Galleria Sabauda in Turin, which is dated 1711.